It's currently sleeting outside, and it's looking like all my holiday plans with family might be put on hold for another time. 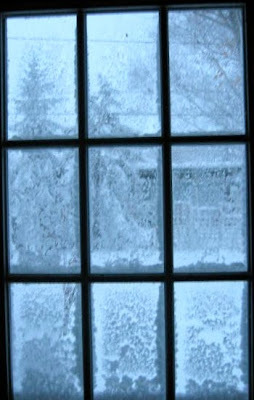 I am trying to decide if I should wrap what presents are left this morning, or if it can wait. You know if I wrap we won't go anywhere, and if I don't wrap I'll be scrambling....so best to wrap. Looking back on the year, I have made a lot of great new friends on Twitter and through this blog. One can never have enough friends, and I cherish all my new friendships! 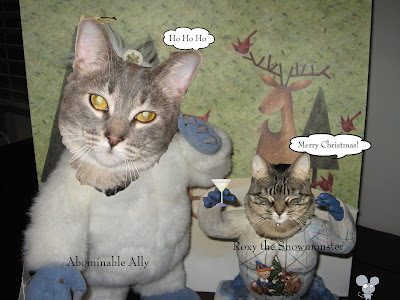 I wish all of you a happy holiday season! Hostapedia -if they do not own the Hostapedia by Mark Zilis, this book is a must have. 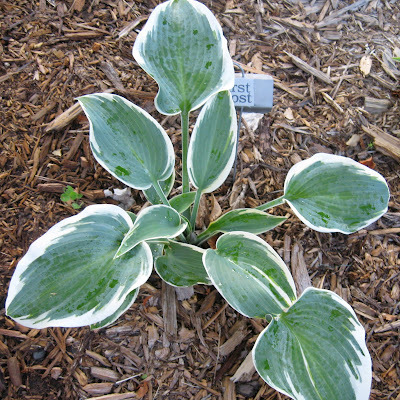 Lists over 7400 hostas and their characteristics. Gift certificates- Since weather does not allow most people to buy hostas right now, why not buy them a gift certificate so the person on your list can buy in spring. Some reputable places to get gift certificates from are: Naylor Creek, In the Country Garden and Gifts, Hallson Gardens, and White Oak Nursery. Fiskars Transplant Spade- this is great for digging up and dividing hostas and other plants. A few weeks ago when I was looking through my Google alerts (yes, I have Google alert send me a daily search on hostas), I came across Steve Knipp's blog. Steve Knipp is an artist who creates hosta pottery. I instantly fell in love with some of the pieces and had to have some for myself and to give as a Christmas present for my hosta loving friend, Gina. So I emailed Steve asking him if I could purchase some pieces. Steve was so gracious, he went out and priced shipping for me and replied quickly. Today my pieces arrived, and they are so beautiful! The plates are for myself, but the platter is for Gina. She is going to love it. They are a great way to get your hosta fix in the dead of winter (as I write this we are in the midst of a blizzard warning, I can't remember ever having a blizzard warning before). I can't wait to have my next get together to show off my hosta plates. First Frost is the 2010 hosta of the year. 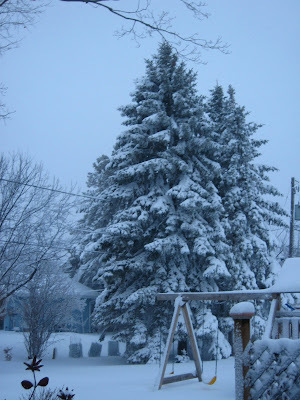 I just put mine in at the end of the growing season in 2008, so you can see mine has some growing to do. Pictures don't do it justice, it's a beautiful hosta. 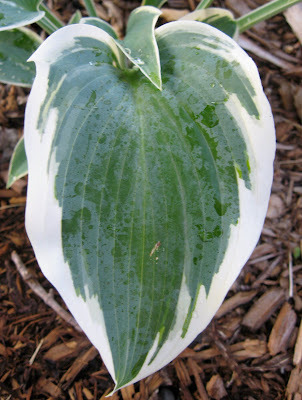 The white margin is so white against the blue/green of the hosta's center.